I was inspired to increase the gross motor activities and invitations throughout our room. I have had great success with the Knock down game [from LEAP HOP, p. 48-49], all while following the principles of Play and Exploration! 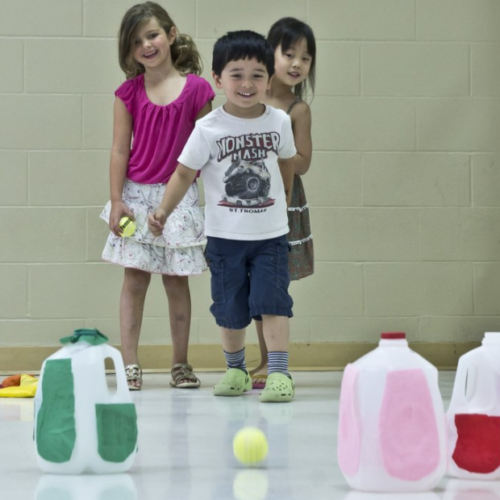 Some of my students (with my suggestion) used our blocks as bowling pins one day. We kept “score” (numeracy) and followed our names on a list. The students began building beautiful “bowling pin” creations some had ramps, many castles, stacking the blocks, and then the fun part of knocking them down with the ball. This has gone on for several days. So today I suggested we write numbers on paper and tape them to the pins so we knew how many points each one was. They loved it! They did it all themselves with a little guidance from me on how to write certain numbers. So once we did that, we set them up and bowled away. Keeping track of points all the way along. Soon they thought we needed “trophies” and they started using glue bottles as trophies, so I saw an opportunity here for something bigger. I took the group that was interested around the school to look at examples of trophies so that we could make our own bowling trophies. The librarian and secretary gave us some books about trophies and medals which created great conversation about different sports, and the Olympics! Tomorrow I will put the invitation out to possibly make a bowling trophy, and see where it goes. And naturally I think we’ll take a trip to the bowling alley soon. Thank you so much for the inspiration and insight, this is so exciting!